Marble is a 6-8 big quietly collecting big attention late on the recruiting trail. 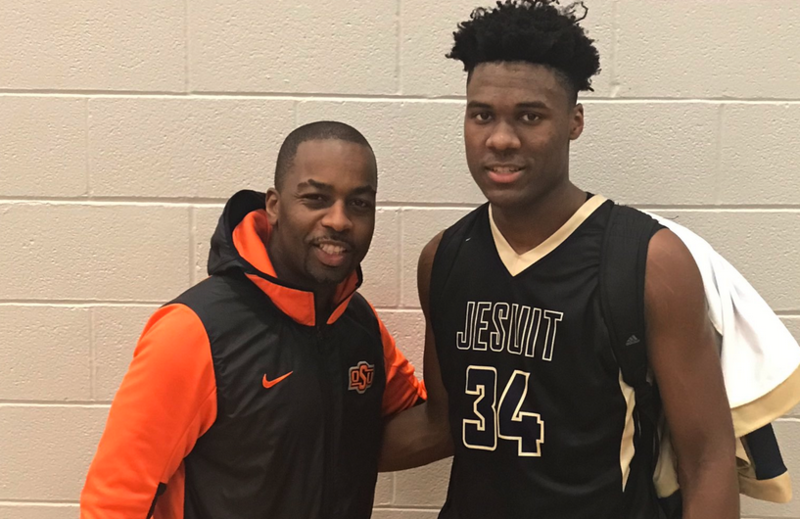 Mike Boynton and Oklahoma State have offered late-rising 2019 power forward prospect Julius Marble, a three-star prospect from Dallas. Marble didn’t sign with any program in the early period, but it’s not for lack of options. He held offers from Travis Ford and Saint Louis, Murray State, Lehigh, La. Tech, Texas State and other mid-major programs, but has held out submitting an NLI yet for next season. Oklahoma State is his first offer of the new year, but potentially not the last. Michigan State and Minnesota have also watched him play recently, and he’s made waves with his play for Jesuit High School where he’s shown himself to be a strong finisher around the rim and shot-alterer on the other end of the court. On Tuesday he scored 23 points and grabbed 10 rebounds in a win over Plano. With two scholarships now available for OSU thanks to the recent dismissals of Maurice Calloo, Michael Weathers and Kentrevious Jones, OSU is on the hunt to use its slots wisely for 2019. In addition to Marble being a late target to emerge, the staff has also made a recent attempt to swoop in on another late riser, 6-7 small forward Ronnie DeGray III, who was offered last week. Marble is a listed 6-8, 205-pound big man who can play either the power forward or center spot at the next level.